When my dad was a little boy, his favorite bedtime story was John Bunyan’s The Pilgrim’s Progress. I’m told he would gasp and cheer as my grandmother read each chapter of the second most-read book of all time (The Bible still holds the top spot). He was riveted by the tale of Christian, his heavy burden, and his journey along the Narrow Way from the City of Destruction to the Celestial City. All while the ultimate enemy tries everything in his power to distract him. But even though I’ve read the book through four times in recent years, I’ve got to admit it: I’m not a fan. I can appreciate Bunyan’s weaving of seemingly half of Scripture into what was the first-ever novel, but the constant barrage of symbolism gets in the way of me enjoying the story. I’ve never seen the adventure and drama that appealed to the likes of C.H. Spurgeon, J.I. Packer and of course, my dad. 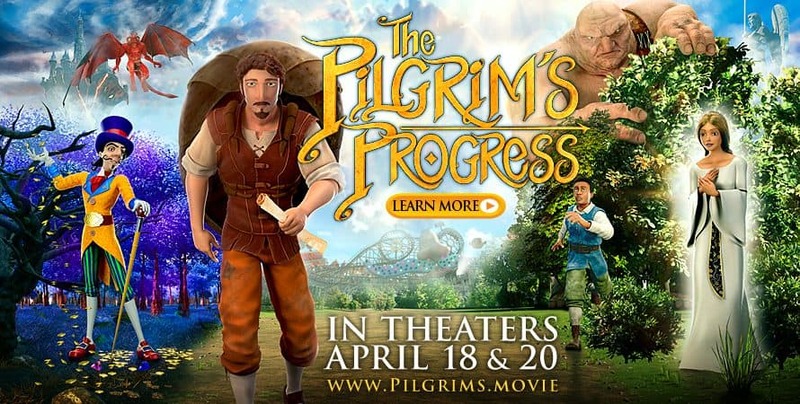 Watching the new animated feature version of “The Pilgrim’s Progress” (coming to theaters April 18 and 20 only), I finally got a small glimpse of what’s made it such a classic for adults and kids alike. Something about an animated version appealed to the kid in me and focused me on the story. The overt symbolism is all still there (a helpful person named, “Helpful,” and a man named “Evangelist” who tells our hero how he might be saved), but while watching I was able to absorb it in a less exhausting manner and simply enjoy the ride. It’s not a perfect movie. The computer animation might have looked cutting edge a few years ago, but it’s a noticeable step down from top notch films from Pixar and DreamWorks. But after a few minutes, I got swept up in the story and didn’t care if a character seemed a little stiff as he walked or that his hair didn’t seem to blow in the breeze in just the right way. In a previous movie version of “Pilgrim’s Progress” from 1978, the performances, script and camera work are all laughably bad – including the multi-character performance of future Oscar-nominee, Liam Neeson. Here, though, I’m happy to report the voice actors are a strong group, led by narrator John Rhys-Davies (Gimli from the “Lord of the Rings” movies and Sala from the “Indiana Jones” trilogy) and Irish hymn-writer, Kristyn Getty. The plot has been condensed and rearranged slightly from the book, but it includes all the plot points of the original while appealing to my desire for a tidier, better-paced story. The direction is surprisingly dynamic as well. With a few more bucks to spend on animation, there wouldn’t be a single thing to complain about. I liked it, and I think it maybe even will help me enjoy the book more the next time I give it a try. I think you’ll probably like the movie, and I think your kids probably will even more. I know Dad would have loved it. To find a theatre hosting “The Pilgrim’s Progress” screenings (there are 15 of them across Missouri), go to www.fathomevents.com.